Update: 13 Feb 2015 – The instructions for installing into an NSF were ambiguous because I referred to ‘the <validator> section’ when there is in fact 2 different ‘<validator>’ sections (one in faces-config and one in the xsp-config’ I have made this section clearer! I wanted to implement a custom validator for validating the input of an email address. There are several ways this could be done, and a normal person would just use some sort of regular expression and a xp:validateConstraint validator, you could also do it in a xp:validateExpression. But I like things to be even simpler, even if it means going through some pain to get there! I was curious to see how can I make my own custom validator that can be reused project to project, served up through a plugin. 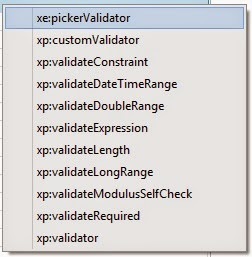 I also wanted to be able to select it from this validators list in the control properties box. To get me started I found a blog post from Jeremy Hodge a few years back. Jeremy’s post was just what I needed to get started. 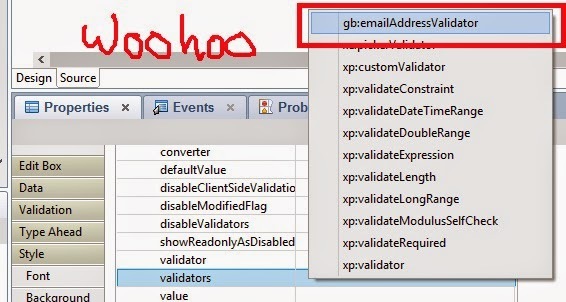 Jeremy describes 3 methods to use a custom validator’s. I’ll let you read the full article regarding the methods because there is a bit of detail, but I decided to go with the method where you create your own class that implements javax.faces.validator.Validator and register it through the faces config file. Here is the validator I created, my EmailAddressValidator! It is pretty simple, it just has to implement the validate function. The parameter ‘Object o’ is the value that is being validated, we turn it into a string and validate it using a regex pattern. The validate function should throw a ValidatorException if validation has failed. So now we can have and endless discussion about which regex pattern should be used but the one I am using basically is anythingbutwhitespace@anythingbutwhitespace.anythingbutwhitespace (any can have extra (.anythingbutwhitespace)’s as needed. You could replace it with whatever you like but this is good enough for me. Before we get into the next section I just want to point out the 2 different types of configuration that we will use for configuring the validator, Faces Configuration and Xsp Configuration. Faces Config files and Xsp-Config files both look very similar but they are not the same thing and it is important to put the correct configuration in the correct type of config file. So at this point I can use the validator using the <xp:validator> tag and reference the validator using a validator id that I register with faces config. Ok great! But now I am still not satisfied, I want to be able to select the validator from the previously mentioned validators box. The secret here is to create an xsp-config file to describe this extension so that Domino Designer knows that it is available. Where do you put all the files? How do you deploy it? This is the easiest method, but you would need to do it for every NSF that you want to use the validator. Update your faces config to include the <validator>…</validator> section of the above code sample titled ’emailValidator-faces.config.xml’. You can do this by going to ‘Application Configuration’ -> faces-config section of the NSF. This is a whole article in itself! Here are the broad ‘checklist’ items (from the top of my head), it won’t be enough detail for you to do it yourself so I created the plugin and put it on github under camac/XPagesEmailValidatorPlugin. Go to the releases section and download! Let me know via github issues if any problems! Deploy to Domino Server via UpdateSite.nsf or similar! So I am very happy with the result, I have my EmailValidator in a plugin, I can select the EmailValidator from the validators drop down. If I get into an argument about the best Regex to use to validate emails, and I end up losing the argument, I can update the regex in one spot, redeploy and all NSF’s on the server will use the new Regex! I can even add properties to choose between different strictness of predefined regex’s if I went down that path. I hope you enjoyed this post and got something out of it, let me know if you have any questions!